Ocean sunfish Mola mola commonly are observed basking at the sea surface. Catching some sun, thinks Beel. Three explanations have been offered for this “basking” behavior: (1) the fish is ill, (2) it is inviting inviting cleaner fish or birds to come remove external parasites, or (3) it is warming itself. 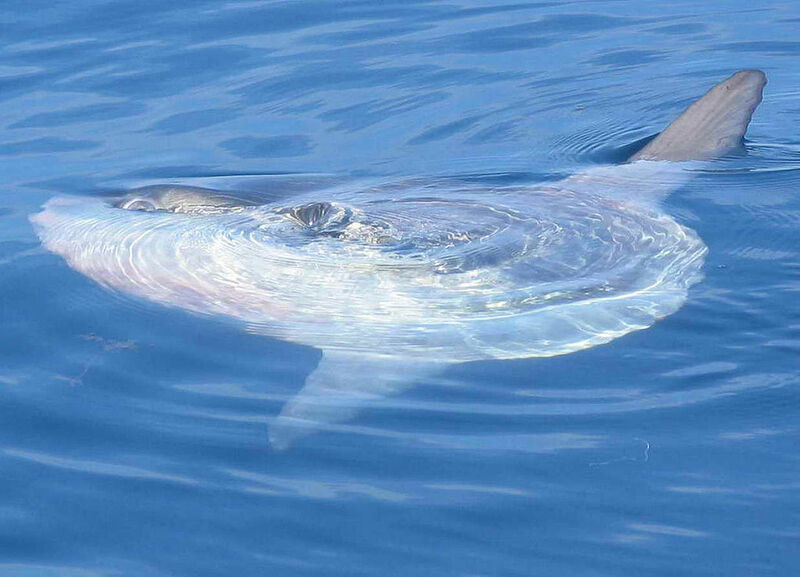 A small number of studies have used transmitters to track the movements of ocean sunfish. These studies consistently have shown that ocean sunfish undergo, at times, extensive vertical migrations. Below, Beel presents a graph from one paper, the results of which are fairly typical. Ocean sunfish generally make frequent long, deep dives during the day that are followed by extended stays at the surface. There is some variation here, Beel notes, as occasionally ocean sunfish have been observed to stay at depth for days, without returning to the surface. But, in general, they bounce up and down between the upper mixed layer of the ocean and the deeper, cooler waters below. Additionally, it appears the deeper the ocean sunfish dive, the longer their subsequent stay near the surface (see above). Because ocean sunfish are remarkably mobile, they experience different oceanic water masses. This, in turn, has an effect on their vertical migrations. Temperatures experienced by a migrating ocean sunfish. Data on the left-hand side of the figure were recorded off the New England coast, whereas those on the right-hand side were recorded near the Bahamas. In 2010, Inga Potter and W. Huttting Howell, described the vertical movements of 25 ocean sunfish tagged off the northeast USA coast. Several of the fish subsequently migrated along the USA coast as far south as Florida, where they encountered the Gulf Stream. As the fish encountered warmer waters, they dove progressively deeper to reach waters below the upper mixed layer of the ocean. 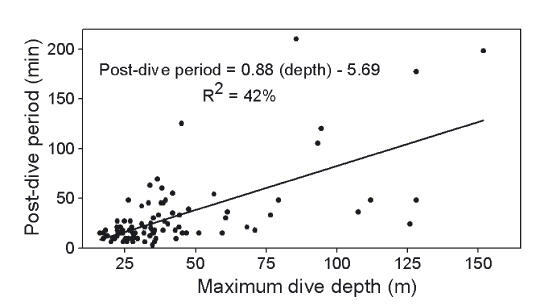 Although Potter and Howell suggested there was no relationship between depth of dive and time spent at the surface, they made this determination based only on those dives made into extremely cold waters. So, what does all this mean? Ocean sunfish feed on jellyfish and other gelatinous members of the plankton. These planktonic organisms are well known to undergo daily vertical migrations. During the day, they migrate downward to depths of 100s of meters, where it is dark, and they are less susceptible to predation. At night, they rise to the warmer, food-rich surface waters to feed. They descend again in the early morning. Vertical migrations made by ocean sunfish are, in all likelihood, feeding forays. By day they move downwards in search of prey, feed, and then return to the surface, where, Beel and others, believe they warm themselves by basking. Ocean sunfish do not migrate vertically at night. There is no need. Their food comes to them! D. P. Cartamil and C. G Lowe. 2004. 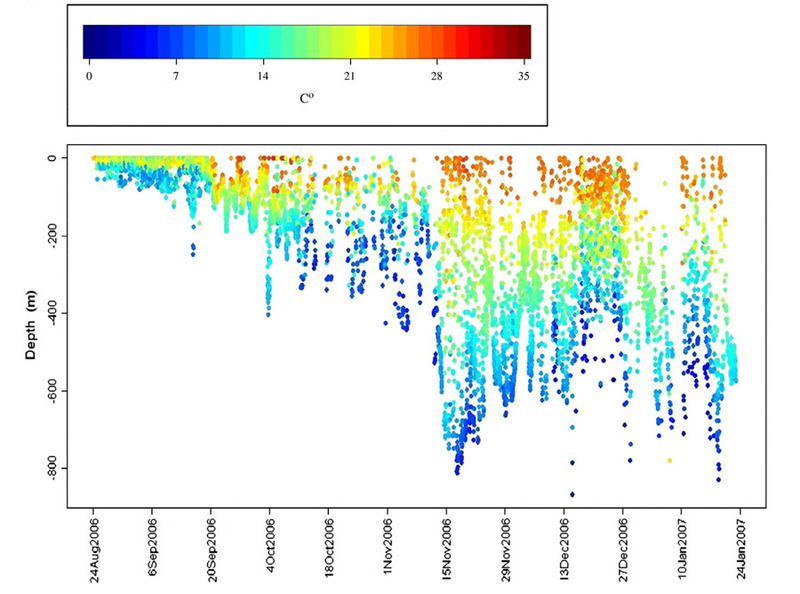 Diel movement patterns of ocean sunfish Mola mola off southern California. Marine Ecology Progress Series, Volume 266, pages 245-253. H. Dewara and others. 2010. Satellite tracking the world’s largest jelly predator, the ocean sunfish, Mola mola, in the Western Pacific. Journal of Experimental Marine Biology and Ecology, Volume 393, pages 32-42. I. F. Potter and W. H. Howell. 2010. Vertical movement and behavior of the ocean sunfish, Mola mola, in the northwest Atlantic. Journal of Experimental Marine Biology and Ecology, Volume 396, pages 138–146. 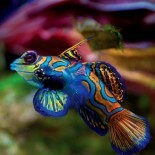 This entry was posted on January 8, 2013 by denstormer in Natural History and tagged Japan, marine fish, USA.